Back in April, a fansite orbiting the LittleBigPlanet unexpectedly crashed into the planet’s surface, and the team that ran it were hired by Mm. That was Tom (me) and Spaff, your community managers at here at Mm Towers. Since starting the job, there has been one project occupying a great deal of our time, especially in recent months; To build a much needed LittleBigPlanet Community site. Today it launches: A one-stop place to get all your LittleBigPlanet news, latest community updates, full details on all the latest downloadable add-on content for the game, details on everything from the trophies, game patches, a help and FAQ section, videos, screenshots, and a Mermahuataur. 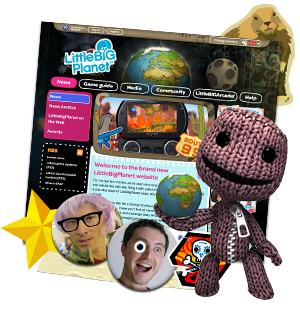 Of course, this week also marks the Launch of Cambridge Studio’s LittleBigPlanet on the PSP, and the site supports our new friend too – with full information and details about the brand new LittleBigPlanet PSP, including playing, creating and sharing on the go. Everything LittleBigPlanet! So we’re all really pleased to bring you the new www.littlebigplanet.com: A mountain of in-game assets combined with over 25,000 of Spaff’s beautifully handcrafted words (translated by Sony’s localisation teams in to 11 languages no less) all bundled together with some peeper shattering visual spazzle-dazzle. It’s the first part of a bigger plan for LittleBigPlanet’s presence on the web, a board from which to build on, and you can be sure that there will be much, much more to come in the future, as LittleBigPlanet continues to evolve its community through the web, and through the games themselves.